Lake Bryan never looked better than for the wedding of Adam and Sarah. It was smooth and there was a brilliant sun reflecting millions of beams of light off its shimmering surface. Paradise Cove, in Lake Buena Vista, near Orlando Florida is nestled along its shores. The venue offers such scenic and beautiful views of the lake and the surrounding lush Florida landscape. It was to this tropical-like venue that Sarah and Adam brought their small group of family to celebrated their special moment. They selected a wonderful non-religious wedding ceremony with the help of Lon Tosi from Sensational Ceremonies. 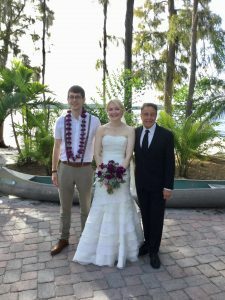 Sarah and Adam selected a ceremony from materials provided to them by Lon Tosi of Sensational Ceremonies. As a destination couple traveling from Great Britain, they depended upon Lon to construct a beautiful ceremony that reflected their “story”. And, it did! It spoke about their journey in love, and indicated that it was “their destiny” that brought them to that gorgeous spot it Orlando to complete their journey toward being a married couple. In fact, their ceremony ended with the very emotional and poignant words from the ever popular Apache Wedding Blessing: “Now you are two persons, but there is only one life before you. My beauty surround you both in the journey ahead, and through all the years. May happiness be your companion and your day together be good and long upon this earth”. No more beautiful words have ever been spoken! We wish this wonderful couple exactly that. Happiness! The couple was planning to spend their honeymoon at the Walt Disney World Resort in Orlando. A fantastic group of vendors made this successful wedding possible. Elegant Weddings of Orlando provided outstanding event management. Everything went along smoothly! Lon Tosi from Sensational Ceremonies officiated this beautiful wedding ceremony. Just look at the gorgeous bouquet that Sarah is holding! It was provided by Flowers By Leslie, and Cecily Castaldo form Castaldo Studio was the photographer. Those photos are going to be so fantastic!. Chesley Rolls played the steel drums. He is an amazing player and provided a tropical flair to the affair, which is so appropriate for the Paradise Cove setting. There is a great lake, beautiful palms and plenty of Florida vegetation. The steel drums helped to make it all come together. We wish you much happiness in your journey ahead Sarah and Adam!